The Parish of All Saints Rosebud with St. Katherine's McCrae is comprised of two (once separate) churches. 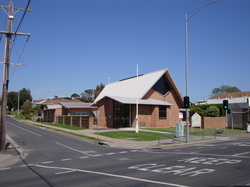 All Saints, which is the major church, is located on Point Nepean Road, facing Port Philip Bay in Rosebud. St. Katherine's, the smaller church, is located in Bartels Street (off Point Nepean Rd.) in neighbouring McCrae. Both churches are in the Shire of Flinders on the beautiful Mornington Peninsula, approximately one hour drive from the centre of Melbourne. Originally our Parish was part of the Parish of St. John's Sorrento. In the early 1960s a new parish was formed which saw All Saints Rosebud and St. Katherine's McCrae becoming part of the Parish of Dromana. The Parish of Dromana was divided again at the beginning of 1988, when All Saints Rosebud and St. Katherine's McCrae became a Parish in its own right. All Saints Church began life as a Nissan hut in the 1940s. The original building was burnt down and plans were put into action to rebuild the existing church which was finally completed in 1963. All Saints is now a large, modern and attractive church seating around 200 people. The church also boasts a large hall with modern kitchen facilities, toilets (including disabled toilets) and a large foyer connecting these areas. Both church and hall are easily accessible for visitors in wheelchairs. St. Katherine's Church began life as a Sunday School in 1947 held on the front verandah of Miss Bartel's home in McCrae. The current site at 15 Bartels Street was donated by the Gray family to be used as a Sunday School in remembrance of their daughter, Katherine, who died tragically in 1946. In 1951, a fisherman's cottage was acquired from the Rosebud foreshore to become the new Sunday School in Bartels Street. In 1957 the first monthly church service was held. By 1960 the congregation had grown and weekly services had commenced. 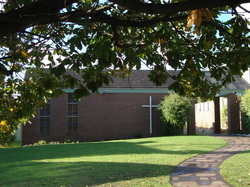 In 1977 the church was extended with the addition of a brick entrance and reception area. Today the church seats up to 50 people but can on occasion seat more.